Images leaked via Synthtopia reveal Access' forthcoming 15th anniversary edition of the Virus TI synth - the Virus TI Snow Black Edition. No official announcement has been hade yet - although one is expected this Friday - so few details are known about Snow Black Edition as yet. 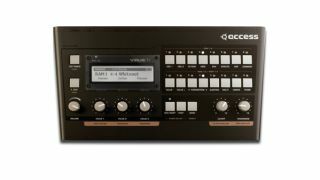 The Access TI Virus Snow is a compact version of the original Virus TI, offering the famous and much-loved sound of its bigger sibling at a friendlier price, but with less polyphony and a cut-down control surface. No pricing or release details are yet known, but the leaked teaser image (below), appears to state that only 15 Virus TI Snow Blacks will be made available.